The mysterious stuff known as dark matter just became less ghostly. It makes up 85% of the total matter in the cosmos and comprises some 27% of the known Universe. For the first time, the enigmatic quantity may have been caught interacting with other dark matter in a cluster 1.4 billion light-years away. Previous studies of colliding galaxy clusters have shown that dark matter barely interacts with anything. And the finding, published in Monthly Notices of the Royal Astronomical Society, may hint at exotic physics - beyond the scope of current theories. According to widely accepted ideas, the visible matter in galaxies exists inside clumps of dark matter. Without dark matter's gravity to stabilise them, galaxies like the Milky Way would tear themselves apart as they spin. Yet despite its all-importance, dark matter's true nature remains elusive. It has been shown only to interact with the fundamental force of gravity. 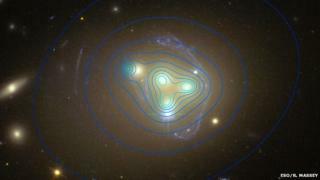 A team of astronomers led by Dr Richard Massey of Durham University studied a simultaneous collision of four galaxies in the cluster Abell 3827. Although dark matter cannot be seen, the team was able to deduce its location using a technique called gravitational lensing. While dark matter does not absorb or emit light, it does have gravity. So it bends the path of light passing nearby, warping our view of anything on the other side of it. The dark matter in Abell 3827 bent the path of light rays coming from a distant background galaxy, which happened to be aligned just right for the team's purpose. The researchers found that one dark matter clump appeared to be lagging behind the galaxy it surrounds. Such a lag between the dark matter and its associated galaxy would be expected if the mysterious stuff was interacting with itself - through forces other than gravity. When Dr Massey and colleagues previously studied collisions between enormous conglomerations of galaxies, such as the Bullet Cluster, they found that the dark matter hardly slowed down. How do studies link together? "The Bullet Cluster collision took place at incredibly high speed," Dr Massey told BBC News. "But in this individual galaxy, the collision could have been going on for a long period of time. "You would expect a small tiny force to build up over time, giving you a bigger offset to detect whether the dark matter interacts - just slightly. That's why we looked at them." This slight interaction seen in the dark matter probably requires exotic physics beyond that explained by the Standard Model, Dr Massey said. "You just need the special conditions to enable this to be seen," he explained. Dr Thomas Kitching, a co-author of the study from University College London, said: "What we measured, with high significance, is an offset between the light emitted from the galaxies in this cluster, and the total mass. "It's too early to say if this is a dark matter effect, or caused by normal astrophysical processes. What we need to do now, is make simulations of these collisions to distinguish these possibilities." Research published by the same team last month placed an upper limit on the interaction of dark matter with its surroundings, while this research specifies the lower limit. "We are finally homing in on dark matter from above and below - squeezing our knowledge from two directions," said Richard Massey. The Large Hadron Collider will take another approach to cracking the mystery during its second run, which began this month. The giant machine under the French-Swiss border will search for dark matter particles by smashing protons together at unprecedented energies.